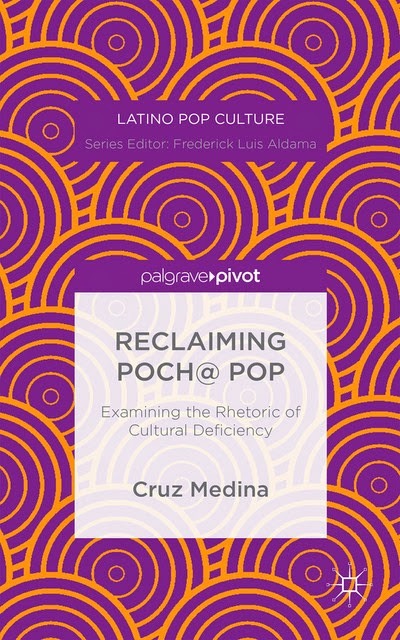 These past few months, I've mentioned different stages of the writing and publishing process of my monograph Reclaiming Poch@ Pop: Examining the Rhetoric of Cultural Deficiency (Latino Pop Culture) , so it's exciting to announce that it is now available for pre-order on palgrave.com and amazon. This book is included in a series for Palgrave MacMillan on Latin@ Pop Culture, edited by Frederick L. Aldama. Poch@ Pop extends scholarship that began with my article on the hip hop fusion group Ozomatli for alter/nativas Latin American Studies journal, but the research began much earlier than that. While living in Tucson, some of the only relief from the ultraconservative legislation being passed came from pop culture artists who actively subverted the political messages about Latin@ immigration and education. "Tracing the historical trajectory of the pocho (Latinos who are influenced by Anglo culture) in pop culture, this book begins with iconic Latin@ films of the 1990s and '80s to demonstrate how representations of English-speaking Latin@s break from cliché misrepresentations. Medina looks at themes including resistance to cultural deficiency through subversive rhetorical productions that engage with issues of immigration, identity, and education. He shows how the trope of pocho/pocha/poch@, which traditionally signified the negative connotation of "cultural traitor" in Spanish, has been reclaimed through the pop cultural productions of Latinos who self-identify as poch@."